I got the recipe from my copy of Gordon’s Ultimate Cooking Course cookbook, which has plenty of excellent recipes, but it is not intended for novices in the kitchen as there are some jargon and instructions (like “make a roux”) that could need some extra explanation. I also made some small tweaks in the sequence of the steps. Bring a large pan of well-salted water to the boil. Add the cauliflower florets and cook for 4–5 minutes until just tender. Remove them with a slotted spoon and refresh in a bowl of ice-cold water to prevent them from cooking any further. Then drain well in a colander. Tip the pasta into the same pot of boiling water and cook until al dente. Drain, refresh under cold running water and drain again. Mix the macaroni, cauliflower and the butter together in a large bowl. In the meantime, heat the remaining butter in a sauce pan, and stir in the flour and mustard powder. Stir constantly with a silicone spatula and cook for 3 minutes until golden brown and smooth. Then gradually add the milk, beating continuously with a whisk until the mixture is smooth. Slowly bring the white sauce to the boil, keep whisking frequently, until thickened. Mix the cheeses together and stir half into the white sauce. Mix well until the cheese has melted and the sauce is smooth again. Season well with the cayenne pepper and sea salt. 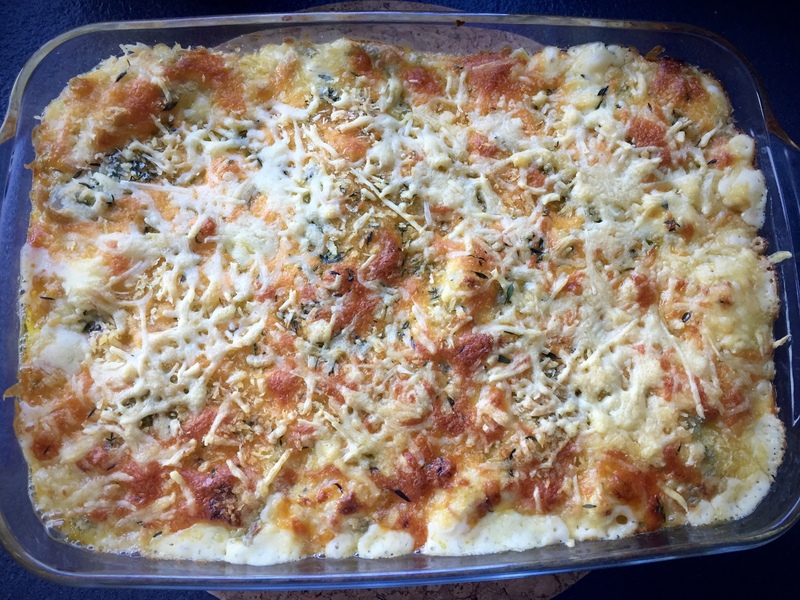 Add the cheese sauce to the bowl of macaroni and cauliflower, mix well and spread into a large, wide gratin dish. Combine the remaining cheeses with the breadcrumbs and thyme leaves. Sprinkle over the top of the dish and bake for about 20 minutes until golden and crisp. Serve and tuck in immediately. This basically is a very nice mac ‘n cheese with some added veg. Rather straightforward in its preparation, but the bite of the cauliflower florets and addition of mustard powder to the base of the roux makes it very worthwhile to give it a try. The kids really liked it, especially the extra crispy cheese topping! The recipe is accurate, easy to follow and serves 4-6 persons. As with all mac ‘n cheeses, do make sure that you use mature cheddar or other sharp cheeses to make the sauce as tasty as possible. Verdict: 8/10; Will be made again. Will this recipe still be good without the cauliflower? Or is the cauliflower a must have? Hi Michelle, thanks for dropping by! Yes, it will be good without the cauliflower. As I said, this basically is a very nice mac ‘n cheese with some added veg.